The two women sprinted to the car, clutching their phones and looking back at two ambulances sitting in the middle of the South Side street. “Where is it going?” one of them yelled as she tugged on the door handle. “U of C,” the other replied, getting into the car. The car backed down the street, followed by one of the ambulances that tore through crime tape around the scene of a shooting that wounded three people late Wednesday, including a 15-year-old boy and a 16-year-old girl. Officers found the three around 10:30 p.m. while responding to reports of gunfire in the 7200 block of South Green Street in the Englewood neighborhood, police said. All three were taken to University of Chicago Medical Center. The girl was in serious condition with a gunshot wound to the head. The boy was shot in the leg and a 21-year-old man was shot in the arm. Both were stabilized. The shooting happened during a deadly 24-hour period in Chicago when at least six people were killed. Another 10 people were wounded between Wednesday and Thursday mornings. The toll is more than double last week’s numbers during the same 24-hour period, which fell on the Fourth of July holiday. Seven people were shot, none fatally, as the police department deployed extra officers for the holiday. Shortly after the triple shooting, three men were killed in separate attacks within an hour of each other, according to police. The first happened around 11:15 p.m. in West Rogers Park when a 19-year-old man was shot in the ear and cheek. He was standing outside in the 2400 block of West Jarvis Avenue when the shooters approached and fired, police said. He was pronounced dead at Presence St. Francis Hospital in Evanston. About five minutes later on the South Side, two men were shot, one fatally, in the South Side’s Gresham neighborhood. The men were with a group of people standing outside in the 8800 block of South Paulina Street around 11:20 p.m. when someone fired from an alley, police said. A 29-year-old man was taken to Little Company of Mary Hospital,where he was pronounced dead of multiple gunshot wounds. A 21-year-old man was shot in the buttocks and taken to Advocate Christ Medical Center in Oak Lawn, where he was stabilized. Around 11:45 p.m. on the Far South Side, a 28-year-old man was shot in the shoulder and pronounced dead at Advocate Christ Medical Center in Oak Lawn. He was on a front porch in the 100 block of East 120th Place in the West Pullman neighborhood when someone fired from a van, police said. Earlier Wednesday, Rogelio Silva was in his West Englewood home watching television with his wife when they heard several loud gunshots about 12:30 p.m.
“Boom, boom, boom, boom, boom,” said Silva, 53. Not wanting to go outside, he and his wife peeked out their windows but didn’t see anything. A neighbor later told them there was a body lying on the ground across the street from their home in the 5800 block of South Winchester Avenue. “My neighbor called the police,” Silva said. 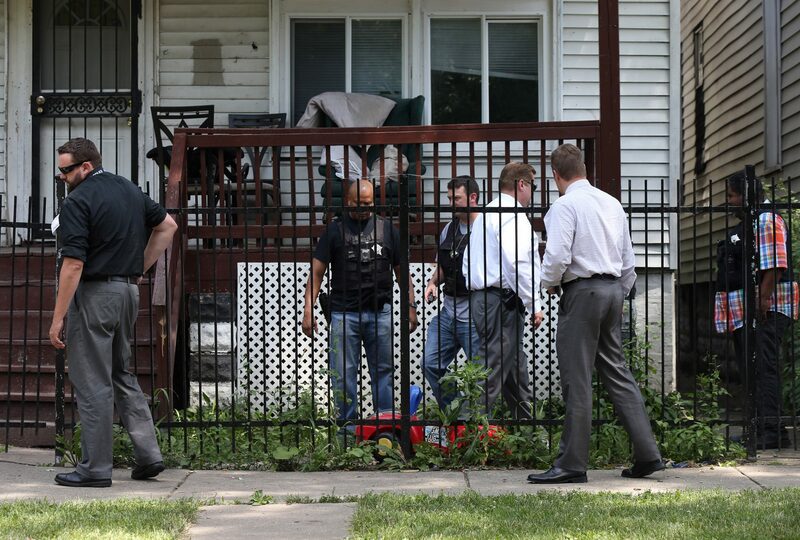 Juan Carlos Laboy-Rodriguez, 38, was shot and killed around 12:35 p.m. and was pronounced dead on scene at 1:32 p.m. It was the first of two homicides in Silva’s neighborhood that afternoon. Around 2:30 p.m., Silva heard more gunfire. Less than half a mile away, 18-year-old Zacchaeus D. Battle was shot and killed in the 5700 block of South Paulina Street, police said. He lived in the same block. Battle was outside when a Dodge pulled up and someone got out and opened fire. He was taken to the University of Chicago Medical Center, where he was pronounced dead at 3:58 p.m.
A third man was killed about 15 minutes earlier on the South Side. Lorenzo Lee Williams, 26, of the 7900 block of South Avalon Avenue, was shot in the chest around 2:15 p.m. in the 7900 block of South Greenwood Avenue in the South Side’s East Chatham neighborhood. He was taken to the University of Chicago Medical Center where he was pronounced dead at 2:36 p.m.